What do you think accounts for the wild swing in the market’s performance over the last six months? Chuck Royce The first-quarter rebound was a response to what started as a sort of normal correction in September. By December, however, it looked more like a hysterical overreaction. The kind of widespread sell-off we saw that month usually occurs in response to an unquestionably negative development, one that’s already hurting the economy or markets, or looks sure to impede them going forward. Investors seemed to be convinced in December that the economy and markets were in much worse shape than they actually were. At this same time, in fact, we observed a corresponding disconnect between company fundamentals, such as the generally strong state of earnings and cash flows, and market sentiment. Francis Gannon Rather than look at what companies were actually doing and reporting, investors acted as if we were about to stumble right into a recession based on softer economic data. Then, after small-caps bottomed on Christmas Eve, it seemed as if the spell was broken. Sentiment shifted radically, and very quickly. The markets recovered just as rapidly—and robustly enough to make the first quarter the 23rd best out of 161 quarters since the inception of the Russell 2000. It’s rare to get a good year’s worth of performance in a single quarter, though when it does happen, it’s typically in response to the kind of steep decline we had at the end of 2018. Were there notable reversals within small-cap performance between 4Q18 and 1Q19? FG Definitely. Investors basically flipped the script between the two quarters. In contrast to 4Q18, the first quarter saw growth beat value, non-dividend payers outpace dividend payers, and non-earners (companies with negative operating income) gain more than earners in 1Q19. The exception was that defensives slightly outpaced cyclicals after also outperforming in 4Q18. Benchmark-beating results came from high-growth areas like software and the bio-pharma complex while cyclicals lagged mostly because of relatively weaker returns from insurance and banks. In fact, exclusive of these two industries, cyclicals beat defensives for the quarter. Were there any other interesting performance developments? CR There were two that I think are worth mentioning. First, we thought it was interesting that high-beta stocks performed much better. 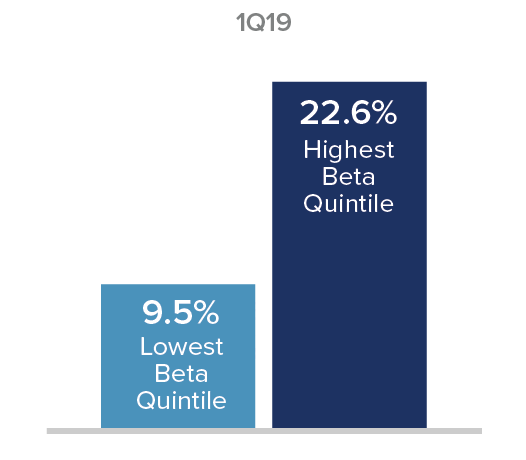 The two highest beta quintiles in the Russell 2000 did best in the quarter, and the lowest and third-highest did worst. 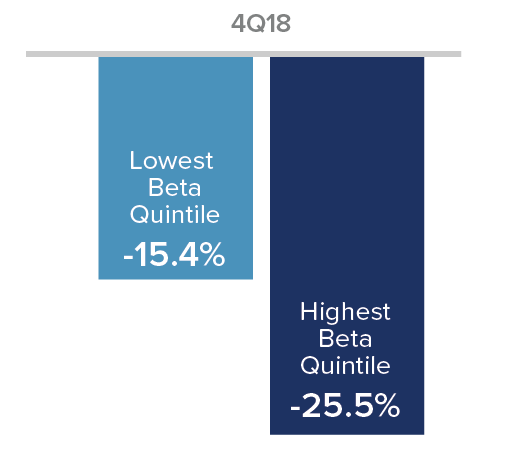 This tells us that investors had a suddenly renewed appetite for riskier names in the first quarter after a significant risk-off fourth quarter of 2018, when the two lowest beta quintiles did best. The other notable development was the dominance of Information Technology and Health Care in terms of the overall contribution to first-quarter performance. These two sectors accounted for almost 40% of the index’s return in 1Q19. Has your outlook with regard to higher volatility and lower overall small-cap returns changed? FG It hasn’t, though I suppose we should reiterate that we’re talking about longer-term periods. In other words, if we look only at 1Q19, we had high returns and very little volatility. 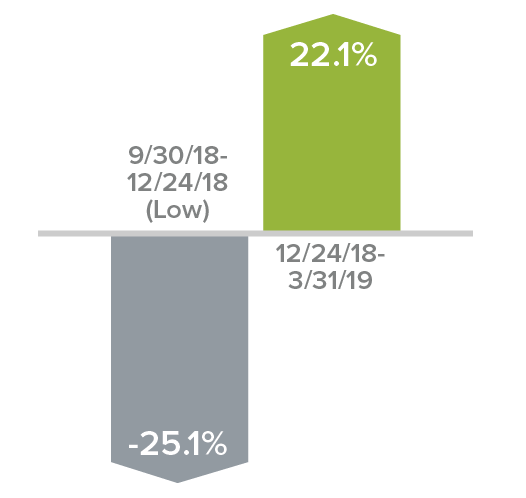 The last six months, however, were very volatile for small-cap stocks, and the return over this same period was negative, with small-caps down 8.6% from 9/30/18 through 3/31/19. The one-year return through the end of March for the Russell 2000 was also quite low, with the index gaining only 2.0%. We think it’s important that investors not get too carried away by last quarter’s welcome rebound. I’d say there’s a pretty strong possibility that gains could be consolidated over the next several months given how robust the rebound was. Why do you think small-cap value has underperformed so persistently over the last five years? CR I see value’s underperformance as among the most surprising and frankly frustrating aspects of the last several years. I’m not sure we know all of the reasons behind it yet, but from my perspective there have been at least two unusual factors in play. One, bond yields have stayed lower for longer than many investors, including ourselves, expected, and lower interest rates are disproportionately supportive to growth stock valuations. Two, the past five years of U.S. economic growth has been very compartmentalized. Most industries have done OK while a smaller number have done very well. It so happens that those areas which have done best—Health Care and Information Technology—are underrepresented in value indexes and most portfolios. A few statistics are notable here: The annualized five-year return for the equal-weighted Russell 2000 was 3.9%, which trailed the capitalization-weighted annualized five-year return of 7.1%. This bolsters the idea of more narrowly based prosperity. In addition, over these same last five years, more than half the return for the Russell 2000 came from Health Care and Information Technology. And within each sector, the more growth-driven areas of software and the bio-pharma complex have done best. My sense is that these dynamics are unlikely to last, though to be fair I’ve had that same sense for a few years now. What is your take on the state of the U.S. economy? CR I think our economy remains fundamentally healthy, with some obvious caveats about trade and tariffs. And I think a couple of points are worth emphasizing. First, periodic slowdowns are common even during periods of expansion. In an economy as large and complex as ours, growth rates are more likely to be a bit lumpy than not. It’s analogous in some ways to sector performance in the market, where it’s rare for each sector to do well, or to do poorly, over the same time frame. Similarly, last year was really difficult for energy companies while for healthcare and certain technology and industrial companies, it was a very good year from an operating standpoint. FG Chuck and I have discussed the notion that investors often overreact to rates of change, or even perceived rates of change, especially coming off highs. So when the pace of growth moves from above average to historically normal or even to slightly above average, we usually see an exaggerated negative response from the market. The overall global economy remains a concern, of course, but both the U.S. and China reported better-than-expected ISM (Institute for Supply Management) numbers in March, so it looks to us like a recession is still further out than many seem to think. There’s been a lot of talk around earnings falling back this year—even talk about an “earnings recession.” Does this square with what you’ve been hearing from management teams? The ISM Manufacturing Index (ISM) monitors employment, production, inventories, new orders and supplier deliveries. CR It does not, and I think we’re seeing a similar distortion to the slowing pace of the economy being confused with an imminent recession. Some analysts and market observers began to warn of lower earnings late last year, but we pay more attention to what the companies are telling us and factor that into our own ongoing analyses. In most cases, we’re hearing qualified optimism with the possibility of minor pullbacks from some companies. Based on that, as well as our own research and observations, we’re not seeing any signs of a contraction in earnings. We also haven’t observed any major shifts in terms of what’s both encouraging and worrying management teams. They’re still concerned about tariffs, trade, and the pace of global growth; they’re still encouraged by growing demand and in most cases are hiring or looking for additional workers. So while there are definitely concerns, right now we’d say that the positives continue to outweigh the negatives, especially with China looking stronger, which makes the global view a little brighter. What is your take on the Fed’s decision to forestall any rate hikes in 2019? FG I think it was significant. It showed that the Fed believed that the announcement they made in December, all but promising three rate increases in 2019, was too much in the context of slower growth outside the U.S. and signs of a slackening pace in our own expansion. I’m not sure I agree that the best response was for them to reverse course and more or less pledge to hold rates steady through the rest of this year, but there’s no question that it reassured investors in the first quarter. How significant do you think the late March inversion of the yield curve was for equity investors? CR That was also important—and in my view a near inevitable consequence of the Fed’s January pivot. We’ve already seen the effect on certain industries. Banks and insurance stocks, for example, were among the biggest performance laggards in the first quarter. In fact, I suspect that both the recent strength of growth stocks and the underwhelming results for many financial stocks were driven not just by concerns about poor global growth but also by the Fed’s pivot and the resulting yield curve inversion. Are you concerned, then, that the Fed’s decision to hold the line on rate increases may create a detour on the long road to normalization? FG It certainly could. Along with the sluggish pace of the global economy in 1Q19, an ongoing low interest rate climate may create headwinds for active approaches, especially those focused on valuation and economically sensitive stocks. This kind of environment has historically offered better weather for growth stocks. Having said that, however, this time could be different. The expectations for these stocks look unsustainably high to us, especially with the possibility of increased global regulation for technology behemoths and potential price controls of pharmaceuticals. What is your outlook for small-cap leadership? CR I think the conflicting signals make the leadership question even murkier than usual. I was pretty convinced at first that the inversion would create a serious detour for cyclicals and active management, but today I’m no longer sure. To add to what Frank mentioned, I see several other factors that argue against the current climate continuing to favor growth stocks: credit spreads contracted in the first quarter, many commodity prices rose, including oil and copper, and housing starts bounced back in March. We wouldn’t typically expect to find these events coinciding with a contraction in economic growth or a more hospitable environment for growth stocks. Equally if not more important to us were the market signals that ran counter to the view that yield-curve inversion points inexorably to recession. Several economically sensitive areas, such as road & rail, semiconductors & semiconductor equipment, chemicals, and electronic equipment, instruments & components all handily outperformed the Russell 2000 in 1Q19. So we’re seeing signs from both the market and the economy that suggest sound health, which would be good for cyclicals. Where have you been finding opportunities lately? FG Even with the impressive run-up in 1Q19, we’ve found opportunities. It’s interesting—the rally was broad based in that all 11 sectors in the Russell 2000 made positive contributions to performance. However, only 77% of the companies in the index had gains. That remaining 23%, which is more than 400 companies with negative or flat returns, is an opportunity set for us because the market has set such low expectations for these companies, which made certain valuations in this group highly attractive to us. CR We’re searching for those businesses where the pessimism looks unwarranted or excessive to us based on the fundamental strengths that we see, such as a conservatively capitalized balance sheet, high returns on invested capital, strong cash flows, and long-term growth potential. Across all of our strategies, this has led us into several areas, including innovation-focused industrials, housing, semiconductors & semiconductor equipment, trucking, and the less speculative environs of health care, to name just a few. What gives you confidence in the long-term prospects for your cyclical holdings? FG First, we anticipate ongoing strength from more economically sensitive cyclical areas in a still-growing U.S. economy, even one in which the pace has slowed somewhat, which is where we find ourselves currently. A recovering Chinese economy should also help many of these cyclical areas. In addition, many of these businesses look very reasonably priced to us as measured by EV/EBIT (Enterprise Value/Earnings Before Interest and Taxes). 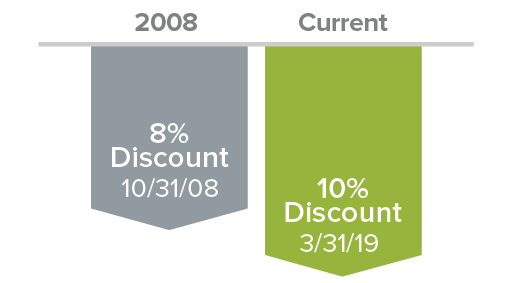 Small-cap cyclicals are trading at a 10% discount to the overall Russell 2000 (again as measured by EV/EBIT)—which is their deepest discount in 20 years. So we’re working to take advantage of a market that, the strong first quarter notwithstanding, still seems unconvinced about the possibility of economic reacceleration, even as the developed world’s central banks appear prepared to use all of the monetary tools at their disposal to sustain or reignite global growth. 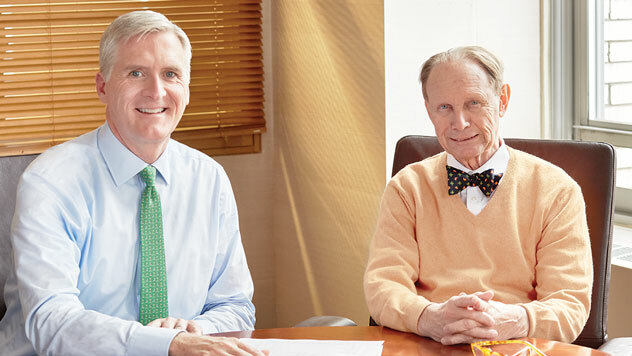 We’re very comfortable with the valuations for the majority of our holdings. We also like that our selective optimism for the long term contrasts with the lower confidence in the economy that we sense from other investors. Mr. Royce’s and Mr. Gannon’s thoughts and opinions concerning the stock market are solely their own and, of course, there can be no assurance with regard to future market movements. No assurance can be given that the past performance trends as outlined above will continue in the future. Beta is a measure of a stock's sensitivity to market movements, with the beta of the market equal to 1.00. A low beta means that a stock’s market-related volatility was low. Trailing 52-week beta vs. the NYSE is calculated and quintiled at the beginning of each quarter. Frank Russell Company (“Russell”) is the source and owner of the trademarks, service marks and copyrights related to the Russell Indexes. Russell® is a trademark of Frank Russell Company. Neither Russell nor its licensors accept any liability for any errors or omissions in the Russell Indexes and/or Russell ratings or underlying data and no party may rely on any Russell Indexes and/or Russell ratings and/or underlying data contained in this communication. No further distribution of Russell Data is permitted without Russell’s express written consent. Russell does not promote, sponsor or endorse the content of this communication. All indexes referenced are unmanaged and capitalization-weighted. The Russell 2000 Index is an index of domestic small-cap stocks that measures the performance of the 2,000 smallest publicly traded U.S. companies in the Russell 3000 Index. The performance of an index does not represent exactly any particular investment, as you cannot invest directly in an index.